When the sixth – and penultimate – season of Mad Men premieres on AMC this Sunday, it will be to great fanfare and anticipation. It is not too much of a stretch to say that no TV show has had such a profound impact on the culture at large in the past decade as Mad Men, and that impact has been multitudinous and varied. The early 1960s had something of a renaissance as a result of the show a couple of years ago, of which Sam Mendes&apos; adaptation of Richard Yates&apos; no-longer-forgotten masterpiece Revolutionary Road was probably the apex. Perhaps most telling about the show&apos;s status as a cultural touchstone, though, was Banana Republic&apos;s Mad Men clothing line, now an established enough phenomenon that its latest incarnation is inspiring backlash. And though Banana Republic may have secured rights to the Mad Men brand, they were not the only company to cash in on the popularity of the show&apos;s aesthetic: while shopping for dresses a few years ago, nearly everything I tried on at Macy&apos;s looked like it could have come straight out of costume designer Janie Bryant&apos;s closet. Mad Men has always been an aesthetic as well as a cultural phenomenon: though it has never romanticized its period, it is such an exquisitely crafted show – from cinematography to production design to costumes, hair, and makeup – that it has typically been difficult to avoid feeling the pull of nostalgia, even if only for the superficial visual culture of the early 1960s. What happens in the offices of Sterling Cooper – and, now, Sterling Cooper Draper Pryce – may be appalling, but the offices themselves are mighty fine looking. But Mad Men has been on the air for a long time, now – when it premiered, George W. Bush was still in office, if you can believe it – and although the show has remained true to its philosophical and psychological roots, its aesthetic is changing rapidly as the show&apos;s timeline moves deeper into the 1960s. When I clicked on the first season six press photos AMC released earlier in the week, I couldn&apos;t help recoiling: I recognized these people, but what on earth were they wearing? Jessica Paré, who plays Megan on the show, is beautiful, but I would never, ever wear this shirt; Roger and Pete, meanwhile, are sporting some unfortunate sideburns. These details may seem trivial, but they really aren&apos;t: what, after all, is Mad Men if it lacks the veneer of beauty which has so long been its hallmark? I noticed this beginning to happen last season – coincidentally or not, the darkest of the show&apos;s run to date – and it will only intensify as time passes. There was a timelessness to the clothes Joan and Betty wore in the show&apos;s earlier seasons, and that timelessness cushioned its other, less pleasant, historically accurate details. Don might have been acting like a cad, but there was nobility to him and to most of the other characters on the show in those early seasons that derived largely from how they looked, and how the world in which they lived looked. Mad Men has changed, of course, as any good show does over the course of six seasons, but I do not think that its essential core has been corrupted or disturbed: it is simply, as time passes, becoming more and more itself. The scales fall from our eyes without the buffer of the aesthetically beautiful (aside from the beauty of the actors, which remains untarnished), and the world that is revealed to exist beneath that buffer is an ugly one indeed. Don, it turns out, is not a charming rogue, but a man who will chase his wife around their apartment and throw her violently to the ground, who will drive away from her at a restaurant in the middle of nowhere and then try, somehow, to blame her for his behavior. Sterling Cooper Draper Pryce is not an exciting, if morally compromised, place to work: it is the sort of place that helps drive a man to suicide, and from which our favorite girl flees as though she is escaping the guillotine. Mad Men&apos;s audience has never been significant, though it&apos;s nearly impossible, now, to measure with any degree of accuracy the number of people watching a given show at a given time. Though its (measurable) viewership has climbed steadily with each passing season, last season&apos;s finale was watched by only 2.7 million people – less, even, than the finale of Breaking Bad, which had 2.8 million viewers, and paltry compared to the 6.3 million people who watched Game of Thrones on HBO last Sunday night. All of these numbers are trifling, though, when compared to the actual population of the United States. If the entire live audience for Mad Men&apos;s finale lived in New York City, they would only have made up around a third of its residents. By comparison, the first episode of the History Channel&apos;s miniseries creatively titled The Bible drew a massive 14.3 million viewers. It is easy for me to say that Mad Men has influenced "the culture," but what I really mean is that Mad Men has influenced the cultural product that I consume, and that its premiere is anticipated by the sort of people I know. An old neighbor from my hometown recently told me that he couldn&apos;t get into the show: "Nothing happens," he said, which is fair enough. People like me revere Mad Men precisely for all the reasons that he finds it dull, and the same goes for many other so-called "highbrow" entertainments. Fifty years ago, the great film critic Pauline Kael wrote in an essay tellingly titled "Fantasies of the Art-House Audience," "I would like to suggest that the educated audience often uses &apos;art&apos; films in much the same self-indulgent way as the mass audience uses the Hollywood &apos;product,&apos; finding wish fulfillment in the form of cheap and easy congratulation on their sensitivities and their liberalism." This can easily be extended to the current state of television, which is somewhat schizoid in its division between expensive, high-art shows like Mad Men and cheap, low-class reality programs that far more people actually watch. Which brings me back to the clothes. Oh, those clothes: remember these? Or this? Even Peggy got in a few good ones. They were stunning. We all talked about them on Monday mornings – did you see what Joan was wearing last night? We talked about those clothes and the characters that wore them as though they were real people we&apos;d met for drinks the night before. We felt good about ourselves for watching Mad Men and understanding it, understanding it deeply in ways that other, implicitly lesser people did or would not. And yet we kept talking about the clothes. We did not want to be Joan or Betty (we did want to be Peggy, sort of), but we wanted to look like them, and dress like them. Kael would no doubt have scoffed at us. 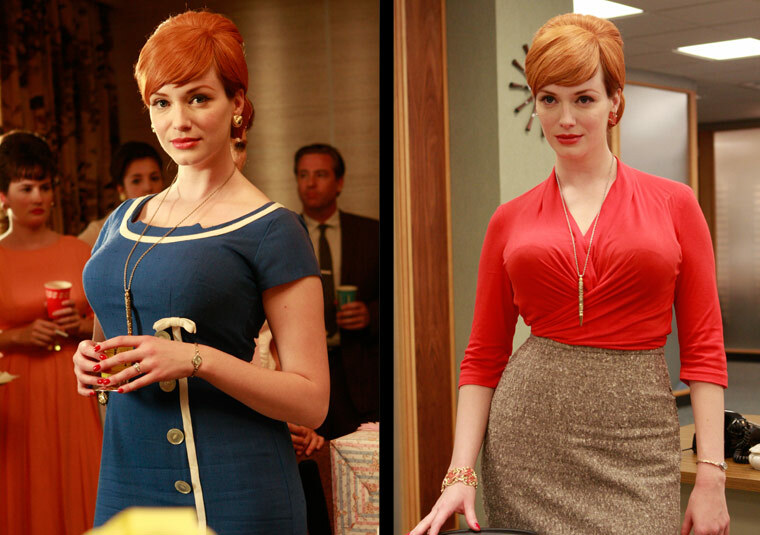 Asking, what is Mad Men without those clothes? Is like asking, what is Mad Men without nostalgia? The answer, quite simply, is: it is ugly. It is not comforting, or pleasant, though it may sometimes be funny. It is bleak, bleak stuff, preoccupied with death and the meaninglessness of life and the ephemerality of identity. It is not trying to make us feel good about ourselves for watching it, or liking it; it is not trying to make us feel good about much of anything at all. It has become, finally, itself: it has forced its audience to stare not at the dresses and baubles and fedoras adorning its characters but to stare down at the abyss with them, feeling just as lonely and afraid.